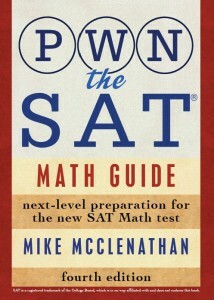 One of the SAT’s most nefarious tricks is the symbol function. That doesn’t mean you should let it intimidate you, though. In fact, symbol functions (and function questions in general) are some of the easiest hard questions you’re going to come across. Which is to say: these questions come late in sections because kids tend to crap their pants when they see a bumblebee (or whatever) used as a mathematical symbol, so these questions come late in the section because kids do poorly on them. That’s an important distinction. Some questions come late because they’re hard, and some come late because kids do poorly on them. Often those are one in the same, but they don’t have to be. If you become comfortable with symbol functions, you’ll basically never get one wrong again. Ok, so what makes these questions so easy? Think of a function question like you think of a car wash. Not like a bikini car wash where you pay $20 and your car isn’t even that clean at the end (WHAT IS THE POINT? ), but an automatic car wash like the one pictured above. If I drive my dirty black Jeep up to the car wash, what’s going to happen? First it’ll get sprayed with water, then with soap, then it’ll get to the spinning brushes, then those dangly-slappy things pictured above (seriously, what purpose do those serve? ), then the rinse, then the biggest hairdryer of all time will blow it dry. What comes out on the other end? A clean black Jeep. Not a clean blue Honda; that’d be crazy. However, if a dirty blue Honda went in after my Jeep, then all the same stuff would happen to it as happened to my car, and then a clean blue Honda would come out. 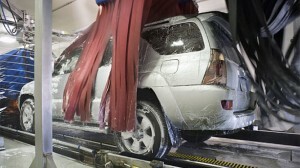 You can always predict what’s going to come out of a car wash based on what goes into it. Functions are the same way. Easy, right? Just put x every place there was an a in the definition, and do the same for y every time there was a b! Again, a function’s output is always predictable based on its input. If 4 ⌺ x = 76, find one possible value of x. It doesn’t matter what the symbol is. All that matters is what relationship it defines. The symbol could be an arrow, or a happy face, or one of those Calvins peeing on stuff that people put on their trucks. It could be ANYTHING. Doesn’t matter. All you need to do is understand the relationship, and then follow the directions. No shortcuts! Since these functions usually denote multiple operations, there are no shortcuts, only wrongcuts. You can’t, for example, see “⊕6 – ⊕2″ and assume that’s the same as “⊕4” because it’s almost definitely not. Also try this hard question I’ve previously posted (post contains explanation). how did you get to the answer for question 20? Thanks for asking! Take it one step at a time. So we’re looking for 206 in the answer choices. Unfortunately, every answer choice also has ♣’s in it. (A) ♣10 = 110 …Nope. (B) 2(♣10) – 14 = 2(110) – 14 = 206 …YESSS. (C) (♣4) + 200 = 216 …Nuh-uh. (D) ♣196 = Something huge. (E) ♣206 = Something even huger. Major trap answer. What’s sup? Can you please explain also how you got that the symbol 10 = 110? The key here: the two expressions will only be equal if the squared expression (x – 5)^2 is equal. (3 – 5)^2 = 4. Which other answer choice will give you a 4 for that squared term? (7 – 5)^2 also gives you 4. So the answer is (D). Of course, that’s the shortcut. You can also get the answer pretty quickly simply by figuring out what ☼3 is (it’s 52), and then figuring out what all the answer choices are. Can you explain how to do 20?